Safety pins tend to be one of those items where you either have none or too many. If you have more than you can find uses for, do not throw them out just yet. One way that you can do to cut down on waste is to reuse the items in your home, including unwanted safety pins. The last thing you should do is throw them in the garbage, where they will sit in a landfill for decades. If the pins are damaged beyond repair, you can recycle them at places that accept scrap metal. In the meantime, there are dozens of ideas out there to help you repurpose these everyday household items. We have gathered together a list of ideas to help you find inspiration. One way to repurpose your old safety pins is to use them as a fashion statement. This will make your look a bit more edgy, as well as add texture to what might normally be a bland outfit. Here are a couple of ideas for you to consider when using pins on your clothes. Create a crop top: This one is especially useful if you have dozens of pins that you do not have a use for. Taking a pair of scissors, cut one of your shirts into a crop top, but do not toss the bottom piece. Instead, use the pins to reattach the bottom piece so that it leaves a slit between the top and bottom. Hold together slits in your clothing: Whether you have clothes with tears or you cut slits into your clothes yourself, you can use pins to accentuate them. Attach the pins to both sides of the slit so that you can still see the slit through the pins. This can turn an accidental tear in your shirt or pair of pants into a purposeful fashion statement. 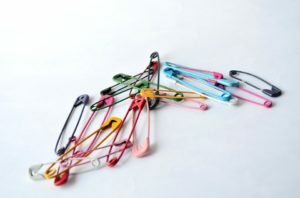 Little did you know, but safety pins can also make your life a little easier by helping some of the items in your bedroom. These couple of ideas are game changers that can inspire you. Lazy day reupholstering: If you have an old headboard that needs some love or has seen better days, some pins can change that in an instant! All you need is enough fabric to cover the headboard. You can even use an old shower curtain as well. Position the fabric so that the front of the headboard looks the way you want, and then use a safety pin to secure each place in the back. From the front, no one will even know it is not a full reupholster. Pin curtains closed: This hack is perfect at home, a hotel, or any other place you are staying the night. Sometimes the curtains in the window do not close completely, leaving an annoying sliver of light that can keep you up at night. In order to avoid losing sleep, use a safety pin to ensure the curtains stay closed. You can pin the two curtains together anywhere as long as it keeps the light out. We have discussed how you can use safety pins to decorate your clothing, but there is more they can do for your clothes. While these ideas are not projects, these hacks can save you from having another project on your hands. Use these ideas to make dealing with some clothes a bit easier. Attach to a zipper: Some dresses have a zipper in the back that takes some silly maneuvers in order to zip it up all the way. They may even require help from someone else! In order to make zipping it up less of an ordeal, attach a safety pin to the zipper. You can even tie a string to the safety pin. With this extra length, you can easily pull the zipper up and remove the pin once you are done. Eliminate static cling: It never fails that some materials create more static electricity in the dryer than others. When you put them on, they stick to your body in weird ways and never seem to lay right. You can use a safety pin to get rid of static cling because metal conducts electricity. All you have to do is pin it on the inside on your clothing, whether it be the bottom of a pant leg or inside a sweater. Hide bra straps: Some shirts are really cute, but they are designed in such a way that it shows off bra straps. All this problem requires is a racerback bra, and a safety pin can turn any style bra into one. Use a safety pin to bring the straps together across your back and you will no longer have to worry about bra straps showing. Pin socks and gloves together: We all joke about socks getting lost in the dryer, but in all reality, it does happen. Thankfully, using a simple safety pin can keep all of your pairs together. Just pin each pair of socks or gloves together and you will never have to worry about them disappearing again. While there are some handy ways to use safety pins, you can also use them to create jewelry. You can make anything from bracelets, earrings, necklaces, and pins. The only limit is your imagination, but here are a few ideas to get you started. Beaded bracelets: In order to create a beaded safety pin bracelet, you will need a lot of safety pins (somewhere around 80, depending on the size of your wrist). You will also need small beads and elastic cording. Undo the safety pins and add the beads until all of them are full. Run the string through the pins and leave the pins so the beads are facing outward. Once you tie the knot, your bracelet is ready! Beaded earrings: These earrings are extremely easy to make. Just string beads on the pin and attach an earring hook to the top of the pin. We do not recommend putting the pin through your ear purely for the fact that it is not very safe, even if you sterilize it. You can find earring hooks at any craft store and it is easy to attach them. Create jacket pins: This project can count as jewelry or as decorating clothing. Using safety pins, you can create all sorts of unique pins for a jacket, backpack, or anything else you can think of. You can even create a brooch. One way to make them is to hang several painted pins from a single one. You can also glue different ribbons, stones, or any other decorative piece to the pin. Once it dries, you can attach it wherever you want and enjoy wearing it! Statement necklaces: Wearing a statement necklace immediately adds an extra flair to an everyday look. If you have several pins around the house, you can easily create your own. You can hang the pins from a chain to make a simple one, or add sequins for a glistening effect. You can also paint them, and if you do not have paint, nail polish works well too. It may sound odd to keep safety pins in your kitchen, but there are uses for them there too. They can help you with your cooking, as well as make your decorations cheaper. If you have the extra pins, it is worth giving them a try. Clean your garlic press: If you are as addicted to garlic as the rest of us and you have a garlic press, you need to try this hack. Once you put the garlic through the press, not all of the pieces come out. An easy way to clean it all out is to use a safety pin, but be sure to clean it first! Odds are, you will be able to find other uses for a pin since it can reach small places. Create plate hangers: One cute way to decorate an empty wall is to hang some decorate plates. However, the hardware needed to hang them can be pricey. Instead, use a heavy-duty craft glue to attach a safety pin to the back of the plate. It works just as well and it saves you money! While the rest of the safety pin projects can be sorted into categories, there are some that do not fit into them. Instead, we will group them all together in an “other” category. These are great ways that you can use safety pins and places you can put them to make your life a little easier. Add to a first aid kit: If you do not have a safety pin in your first aid kit, you need to add at least one. If you have to wrap something up, a pin can help keep it from coming undone. A safety pin can also help get rid of splinters, but make sure to sterilize it first! Give your purse security: If you live in a city with a dense population or will be visiting a place with a lot of people, this hack is for you. Take a safety pin, attach it to the zipper of your purse, and then run it through the strap of your purse. This will make the purse more difficult to open, which will deter any potential pickpockets. This is a must-have security feature! Organize buttons: Organization is difficult, especially when you have so many small pieces for crafting. Most households probably have a container filled with any extra or spare buttons they have. If you want to organize them even better, thread them along a safety pin. This will make it easy to keep them all together and not lose any. Secure your keys: This is another security measure you can take if you are going to an amusement park for the day. In order to keep your keys safe on the ride, use a safety pin to attach them to the inside of your pocket. This will keep them in your pocket, even if you take a roller coaster through some loops! There is so much you can do to repurpose the safety pins you have at home. Some of these uses are longer projects that take time and effort, while others are quick fixes to add convenience to your life. No matter what you choose to do, each of these will help you reuse the items you already have at home. There is no need to buy other items when a safety pin will do the same thing. Doing this will cut down on waste and save you money in the long run.